The Foster-Powell neighborhood's "Benson Bubbler" bronze water drinking fountain, formerly situated on S.E. Foster Road at 65th Avenue, had bad luck in 2018; it was smashed in the spring, and then – overnight in December – it was outright stolen. "After the car accident, it was taken out of service for several weeks to be repaired, and was replaced in June last year," reported Portland Water Bureau (PWB) Public Information Officer Jaymee Cuti. Locals were assuming that the iconic fountain, gracing this corner for at least three decades, had been removed for the street construction along Foster Road. But, sometime after 8 p.m. on December 6, and before 6:30 a.m. the following morning, it vanished – having been partially obscured by a construction fence that was surroundeding the area. All that remained at the site was a small water tube protruding from the street, and broken pieces of its concrete ring base. 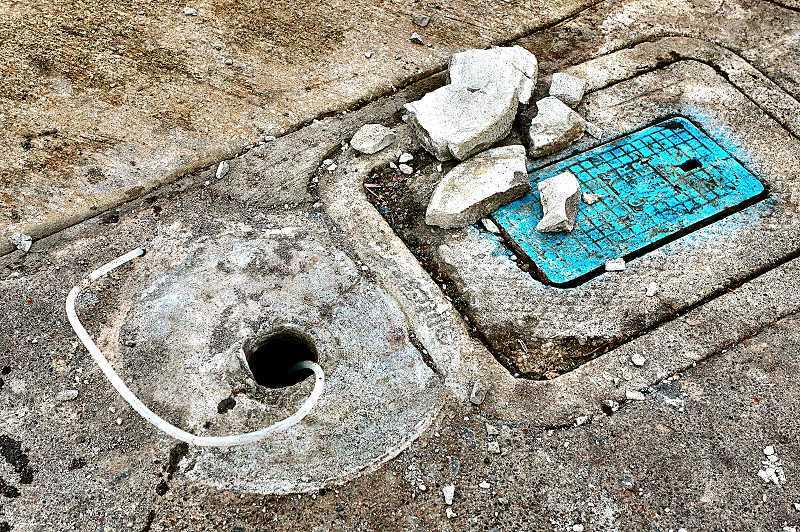 "Who knows if someone did it as a prank, or took it to steal the metal – but it's a sad day for Foster-Powell," reflected Darren Meyer, as he gazed at the bare spot on the sidewalk where the historic fountain once stood. PWB sleuths have been working – to no avail, so far – to find the boosted bubbler or to identify the culprits, said Cuti, when asked for an update on the story in mid-January. If you can help with the search, call them at 503/823-6084.